Ex-Holden executive Dean Hoverd has been appointed General Manager of White Motor Corporation (WMC), Higer Bus and JAC Trucks New Zealand operation. Hoverd spent three decades in sales and management roles in both New Zealand and Australia, recently as National Sales and Marketing Manager for Holden NZ’s subsidiary Isuzu New Zealand. WMC CEO Jason Pecotic says Hoverd’s appointment gives the company a boost in establishing its operations and sales network in New Zealand ahead of the impending JAC trucks launch. 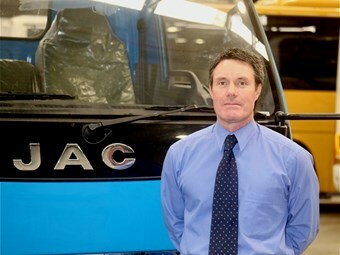 "Dean's experience and achievements in the New Zealand truck market will be invaluable as we build our market presence with both JAC trucks and Higer bus," Pecotic says. "He has an intimate knowledge of the New Zealand commercial vehicle market from both his time at Isuzu as well as his experience in the retail car and truck business." Pecotic says there is no one better equipped to oversee the establishment of JAC and Higer in NZ. Hoverd says he is looking forward to the challenges of establishing JAC and Higer in the New Zealand market and believes that Kiwis will be quick to embrace Chinese products. "This is an exciting opportunity to deliver new competition with quality, cost effective commercial vehicles to the Kiwi market," he says. "The level of engineering and equipment in both the JAC and Higer product lines will surprise many and I believe it is going to quickly gain a strong foot hold in NZ." Higer is China's largest exporter of buses and coaches producing more than 20,000 buses a year from its 500,000 square metre manufacturing plant in Suzhou Industrial Park near Shanghai.